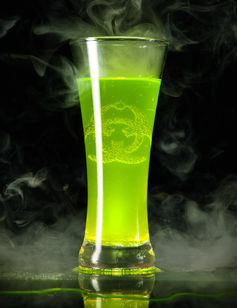 Refreshingly radioactive?Drink image via www.shutterstock.com. But there was a time when energy drinks actually contained real energy. The active ingredient in these drinks was radium, a radioactive element that releases a packet of radiant energy with every atomic decay. While the connection between consuming a radioactive element and reaping a perceived energy boost is tenuous at best, it didn’t stop people in the early 1900s from ignoring the known downsides of ingesting radioactivity and risking the long-term health consequences. RadiThor claimed to be a panacea for a variety of health ailments. One of these energy-containing products was RadiThor. This energy drink was simply radium dissolved in water. It was sold in the 1920s in one-ounce bottles costing about US$1 each ($15 in 2016 dollars). Its manufacturer claimed the drink not only provided energy but also cured a host of ailments, including impotence. Evidence for a sexual benefit to humans was lacking, but at least one scientific paper claimed that radium water could increase “the sexual passion of water newts.” For many men, in this pre-Viagra era, the water newt evidence was enough. RadiThor was a big seller. RadiThor’s most famous customer was Eben Byers, a Pittsburgh industrialist and amateur golfer of some repute. Byers first became acquainted with RadiThor when he took it to help heal a broken arm. Although the product contained no narcotics at all, Byers became at least psychologically, if not physiologically, addicted to it. He continued to consume large amounts of RadiThor even after his arm had healed. He reportedly downed a bottle or two daily for over three years, and sang its praises to all his friends, some of whom also took up the RadiThor habit. In the end, Byers’ RadiThor addiction killed him. Unfortunately, ingested radium gets incorporated into bone and all of its radiation energy is, therefore, deposited in bone tissue. Over time, the radium delivered a whopping radiation dose to Byers’ skeleton. He developed holes in his skull, lost most of his jaw and suffered a variety of other bone-related illnesses. Ultimately, he died a gruesome death on March 31, 1932. 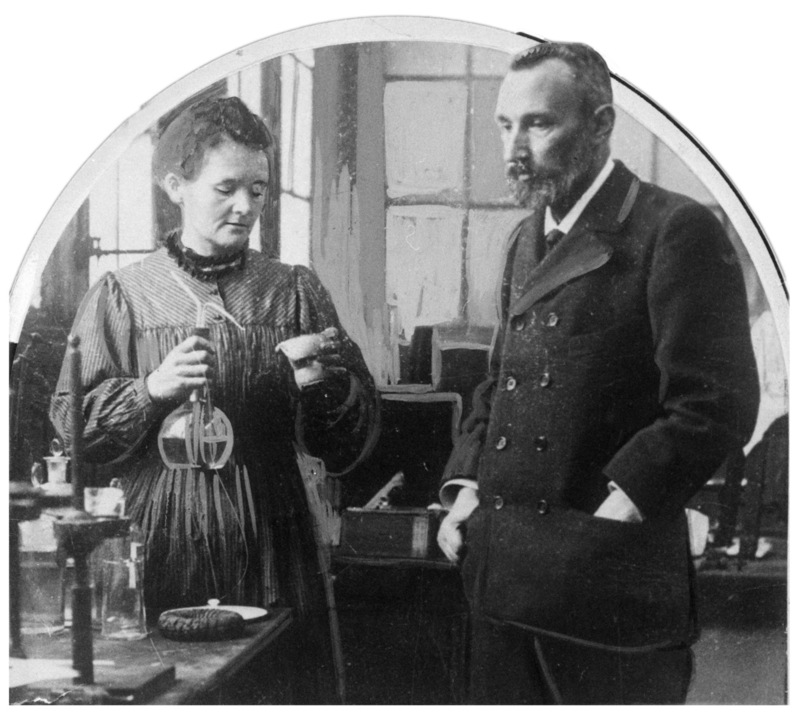 Marie and Pierre Curie, the discoverers of radium, understood the dangers inherent in eating it, and never condoned its use in food or drinks. 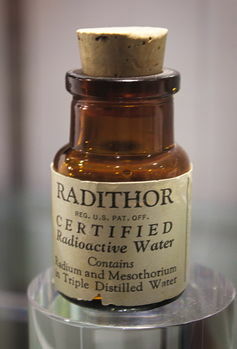 The shame of this was that the dangers of ingested radium were already known, even before Byers started taking RadiThor. As I describe in my book, “Strange Glow: The Story of Radiation,” the medical community had been studying the health effects of radium since its discovery by Marie and Pierre Curie in 1898. British scientist Walter Lazarus-Barlow had published as early as 1913 that ingested radium goes into bone. And in 1914, Ernst Zueblin, a medical professor at the University of Maryland, published a review of 700 medical reports, many of which showed that bone necrosis and ulcerations were a frequent side effect from ingesting radium. Unfortunately, the early red flags went unnoticed, and RadiThor sales remained strong through the 1920s. When Byers died, he was put to rest in a lead-lined coffin, to block the radiation being released from the bones in his body. Thirty-three years later, in 1965, an MIT scientist, Robley Evans, exhumed Byers’ skeleton to measure the amount of radium in his bones. Radium has a half-life of 1,600 years, so Byers’ bones would have had virtually the same amount of radium in them as they did on the day he died. Evans was an expert at measuring and mathematically modeling the human body’s uptake and excretion of radioactivity. Based on Byers’ self-reported RadiThor consumption, Evans’ model had predicted that Byers’ body would contain about 100,000 becquerel of radioactivity. (“Becquerel” is an international unit of radioactivity.) What he found was that Byers’ skeletal remains actually had a total of 225,000 becquerel, suggesting that either Evans’ model of radiation uptake was underestimating radium’s affinity for bone, or alternatively, that Byers had actually understated his personal RadiThor consumption by a factor of at least two. It was not possible to determine which alternative accounted for the discrepancy. Once Evans had completed his radium measurements, he returned Byers’ bones to their lead coffin in Pittsburgh, where they remain to this very day, as radioactive as ever. Although Byers certainly suffered from the radium in RadiThor, consumption of these energy drinks never developed into a major public health crisis. This is primarily for two reasons. Firstly, unlike Radithor, most of the other “energy” drinks on the market were total frauds and had no radium (or any other type of radioactivity) in them at all. 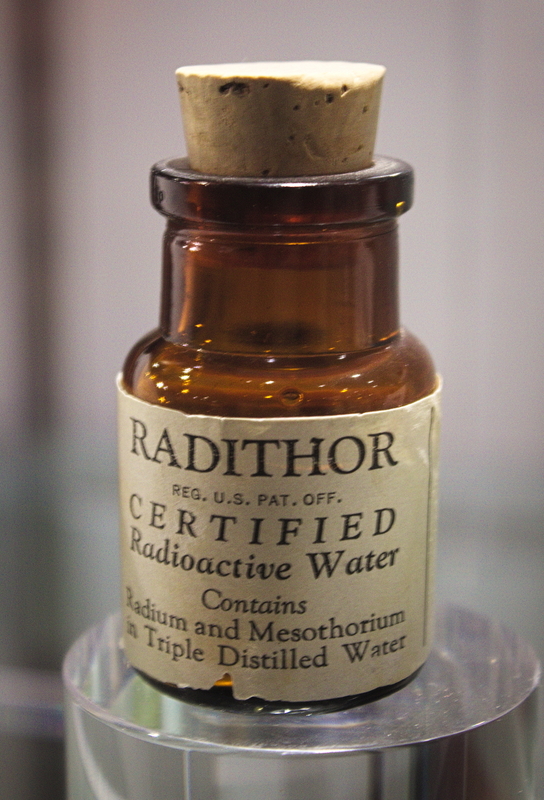 Secondly, RadiThor and other products that actually did contain radium were very expensive because radium was a relatively rare and precious element that was costly to mine and purify. So only the wealthy, like Byers, were able to drink it on a daily basis. Consequently, RadiThor ailments were confined largely to the few who could afford to pay for it. Ultimately, in the interest of protecting public health, the federal government closed down the Bailey Radium Laboratories – the company that made RadiThor – and radium-containing energy drinks disappeared from the consumer market by 1932. Radioactive drinks are no longer on the market. Today, the energy drink market is occupied by drink formulations that rely on the stimulant caffeine to invigorate their customers and provide them with the enhanced “energy” that they seek. Caffeine – the commonplace ingredient in coffee, tea, chocolate and cola – may not be as exotic as radium, but it actually is a stimulant, so customers do feel energized, and it isn’t very dangerous to health. Today’s customers seem content with these newer alternatives to radium-containing RadiThor. It’s not clear, however, whether the water newts are satisfied.